One of the most critical environmental challenges facing both Californians and Australians in the 1860s involved the aftermath of the gold rushes. Settlers on both continents faced the disruptive impacts of mining, grazing, and agriculture; in response to these challenges, environmental reformers attempted to remake the natural environment into an idealized garden landscape. As this cutting-edge history shows, an important result of this nineteenth-century effort to "renovate" nature was a far-reaching exchange of ideas between the United States—especially in California—and Australia. 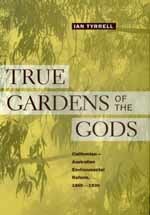 Ian Tyrrell demonstrates how Californians and Australians shared plants, insects, personnel, technology, and dreams, creating a system of environmental exchange that transcended national and natural boundaries. True Gardens of the Gods traces a new nineteenth-century environmental sensibility that emerged from the collision of European expansion with these frontier environments. Tyrrell traces historical ideas and personalities, provides in-depth discussions of introduced plants species (such as the eucalyptus and Monterey Pine), looks at a number of scientific programs of the time, and measures the impact of race, class, and gender on environmental policy. The book represents a new trend toward studying American history from a transnational perspective, focusing especially on a comparison of American history with the history of similar settler societies. Through the use of original research and an innovative methodology, this book offers a new look at the history of environmentalism on a regional and global scale. Ian Tyrrell is Professor of History at the University of New South Wales, Sydney. He is the author of The Absent Marx: Class Analysis and Liberal History in Twentieth Century America (1986), and Woman's World/Woman's Empire: The Woman's Christian Temperance Union in International Perspective (1991).